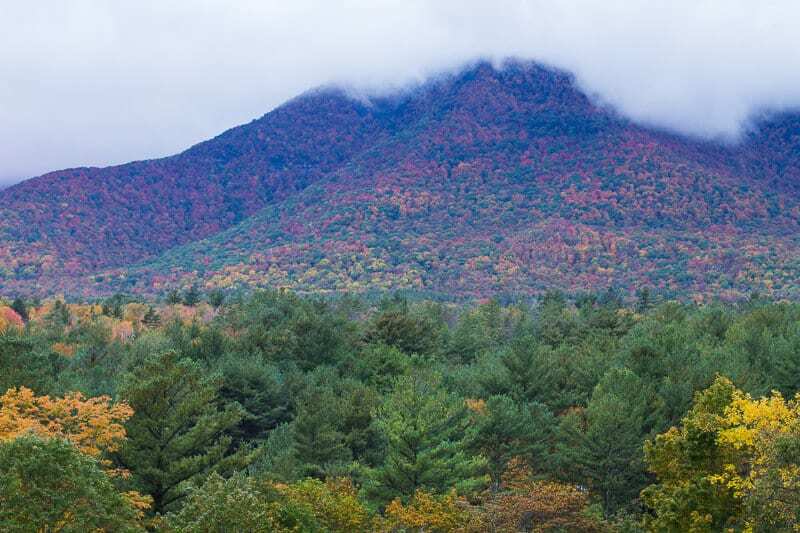 Our introduction to New England was in the quaint town of Manchester VT in the valleys of the Green Mountain National Forest. It was a long two-day drive to get there from North Carolina and we arrived late afternoon. We missed the turn off to our accommodation, which lead us to this driveway to turn around. I quickly snapped a photo, which was so popular on our social channels. Loving the feel of Vermont already. Quick capture on my phone on arrival before the sun went down. I feel like we’ll be seeing a lot more scees like this.Follow our stories for more Any tips for Vermont? I really think it captured the spirit of New England – colonial, patriotic, warm, and perfectly suited to the spirit and vibrancy of Fall. It has been a dream of mine to visit New England in the Fall for many years. I think Fall is possibly the only time humans celebrate change and transformation, I wanted to celebrate it in the place where the leaves danced in vibrant fashion. Sadly, in some parts of the North East, the weather was unseasonably warm, which meant the leaves weren’t singing the loudest. 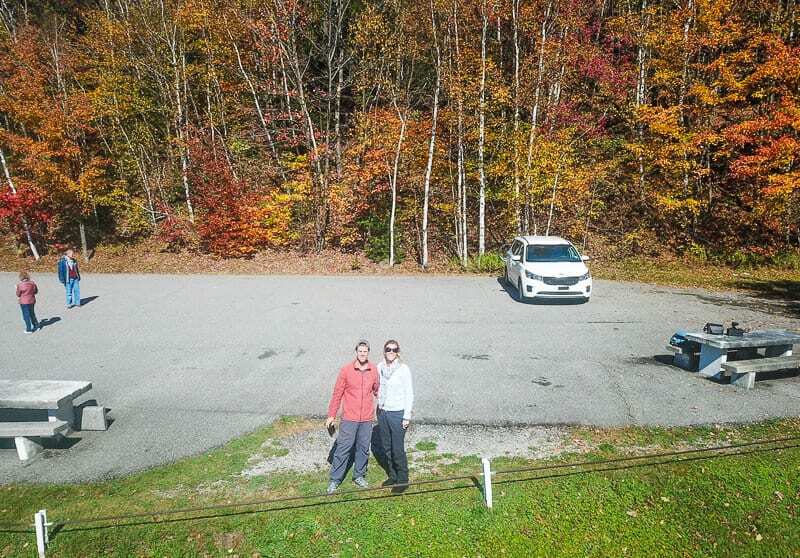 But, it also meant the leaf peeping season was late, and we were late getting to New England, so lucky for us we caught the leaves at their peak colors. 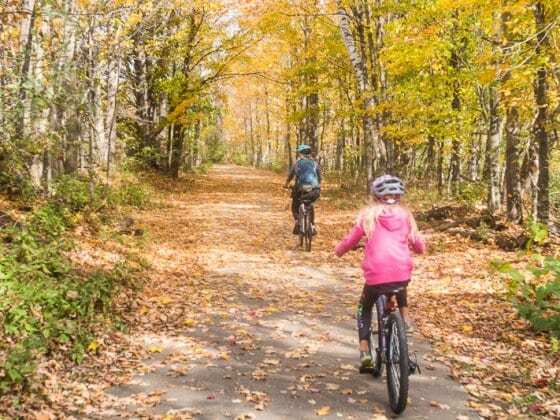 Apparently it wasn’t as brilliant as other leaf peeping years in Vermont, but for an Aussie family, the colors were pretty special and something we sure don’t get Down Under. Mother Nature is going to do what Mother Nature does and we embrace and celebrate the gifts she chooses to give us as they are. We stayed in Manchester Vermont for three nights and did our best to chase the leaves all over the Green Mountain region. Manchester VT is a bucolic town in the Battenkill Valley in south western Vermont. 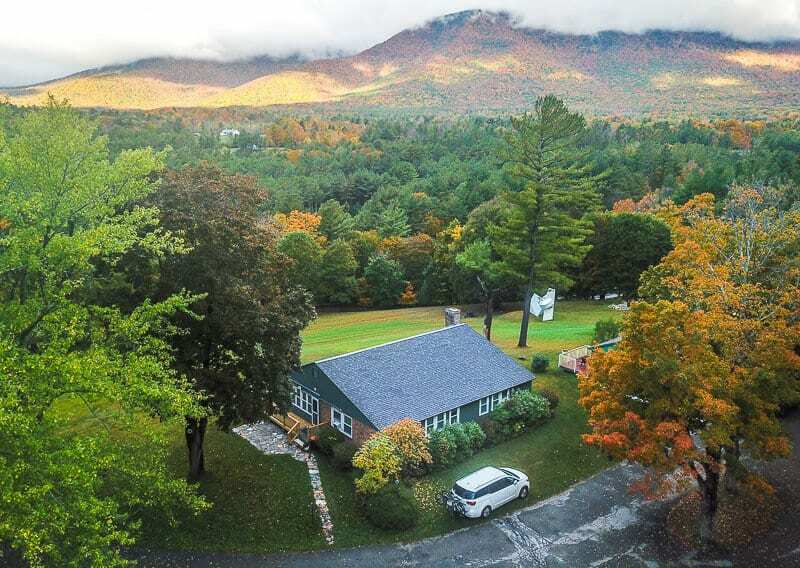 It’s relaxed and sophisticated, and while I preferred the town of Stowe in the northern part of Vermont, Manchester is a great base to explore Vermont’s unspoiled Green Mountains! 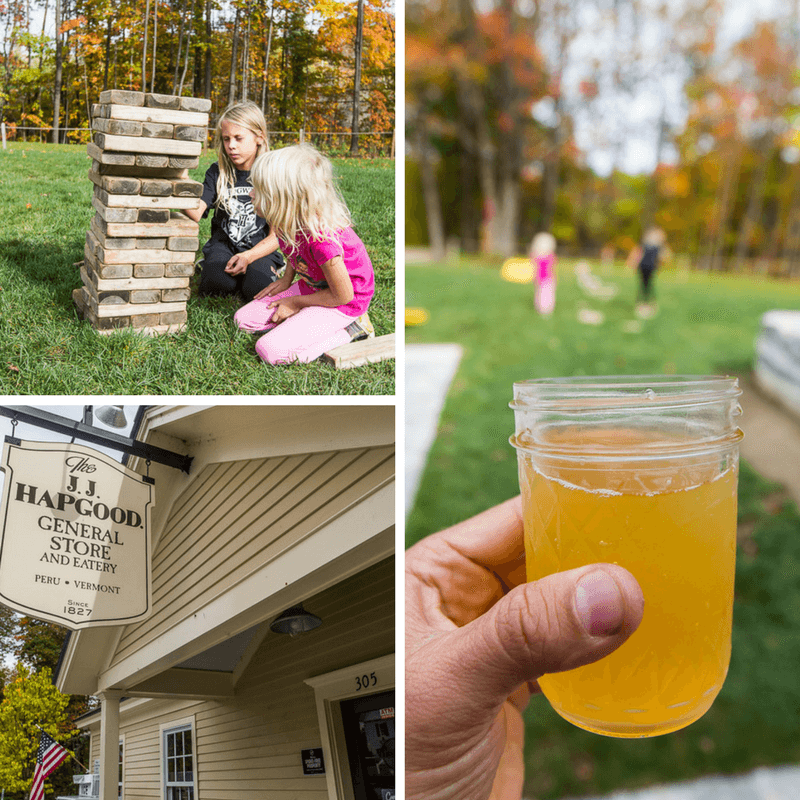 Here are some of the fun things we did in Manchester Vermont. We were excited to be using our new bikes for the first time in New England. 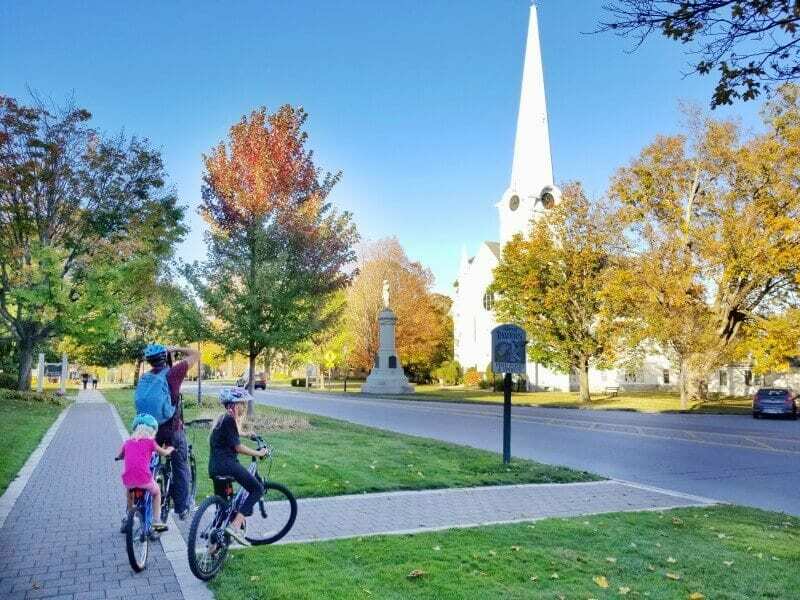 What better way to explore Manchester VT than riding down the charming Main Street, which splits Manchester into two sections. We began in Manchester Village, which is where you’ll find many of the white columned mansions and Victorian-era inns. Mary Todd Lincoln and her children from Washington D.C. spent two summers at The Equinox, which is said to be haunted by Honest Abe’s beloved wife. A little cycle further north and you’ll reach Manchester Center with the more unpretentious stores, one of the most famous being the Northshire Bookstore sitting on the corner of a busy intersection. There are a few arts and crafts shops and restaurants here as well. 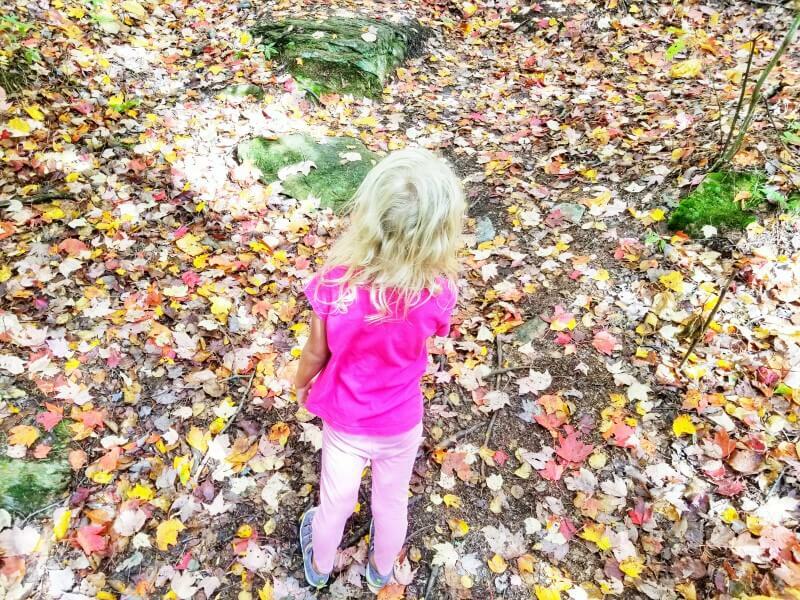 We chose the Prospect Rock Walk as it seemed family friendly and offered good views over the Manchester Valley. It was an uphill, 3.1 mile return walk. The uphill was fairly gentle though so easy enough to do with kids. It’s a dirt trail beside a creek for some of it. 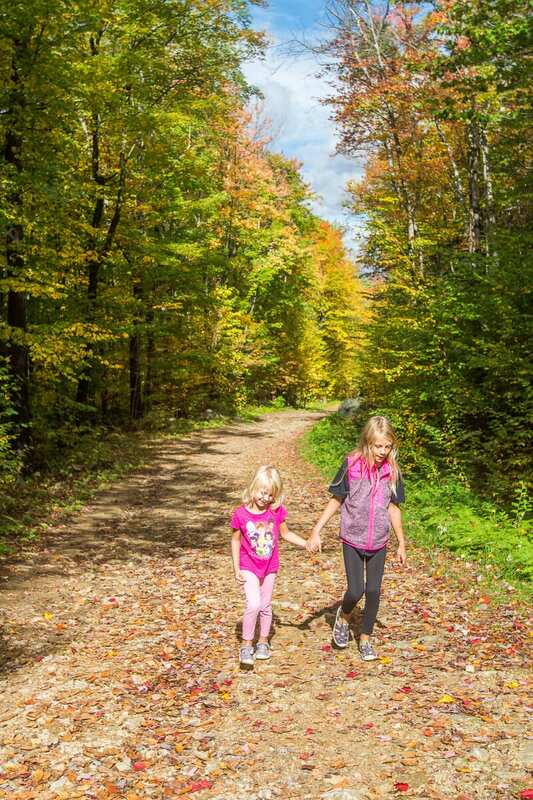 The girls enjoyed the walk and seeing the fall colors for the first time. It winds along a mountain brook before departing into birch-beech forest on a wide and open logging path. The trail criss-crosses the Appalachian Trail and Long Trails. Be warned, you may miss the entrance to Prospect Rock. It comes off the main trail on the right. I only saw it because I glimpsed at the group of Malaysians in front of us who were standing on the rock. 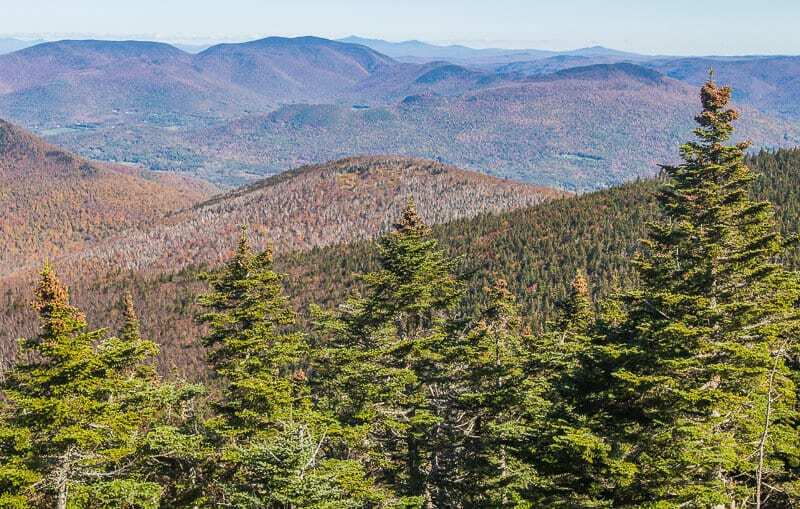 Once we figured out how to get there we looked up and saw a small sign camouflaged high up on the tree trunk pointing you to the beautiful views of the Manchester Valley with Mount Equinox to the west. Looking for a bit of nostalgia and quirky character on your Vermont Road trip? 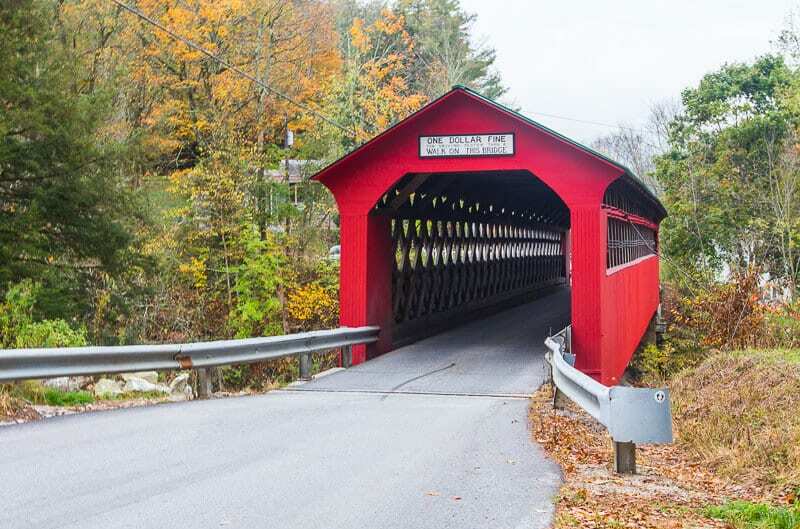 A drive discovering the covered bridges in Southern Vermont and the Manchester VT area might be just your thing. We learned that Covered bridges are quite the things to do in New England! They are also called kissing bridges for the lovers who’d linger as they passed through. Vermont has more than 100 covered bridges. We jumped in the car to explore five of them from Manchester to Bennington. On one cooler overcast day we jumped in the car to explore the covered bridges south of Manchester down to Bennington. If you’re short on time, I’d skip this, or at least visit the following two covered bridges, which I found most interesting. You can get a bit covered-bridge tired after the first couple. Just down the country road from Manchester and spanning the Roaring Branch and tucked down into the dip was our first covered bridge sighting. Slow down so you can see the sign upon entry, and so you don’t get a fine. As the sign says, it’s a $1 fine for driving too fast across it! Two miles from the New York border is the cute West Arlington Bridge spanning the Batten Kill River. The West Arlington Bridge was built in 1852 and is on National Register of Historic Places. It is one of the most known, and photographed in Vermont. 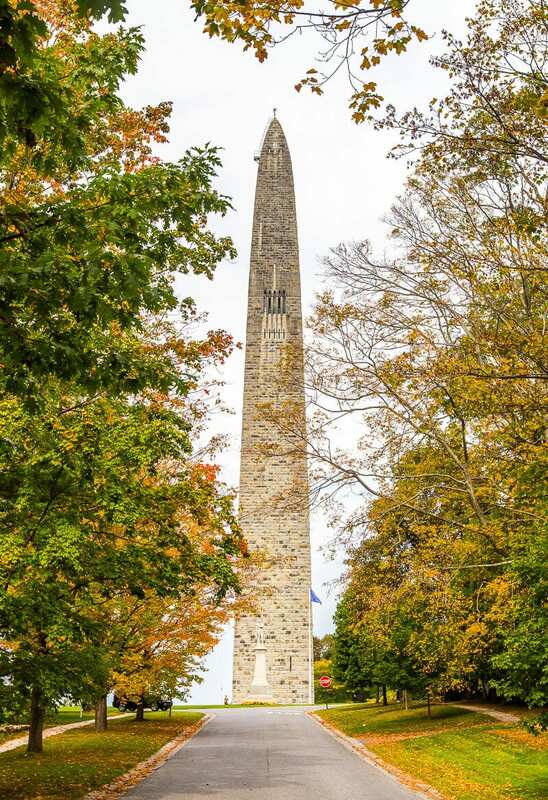 Looking for historical things to do in Manchester VT and fancy a bit of Revolutionary War history? For $5 you can take the elevator to the top of the Monument (306 ft high). I’ve you’ve come all this way, I recommend you do. 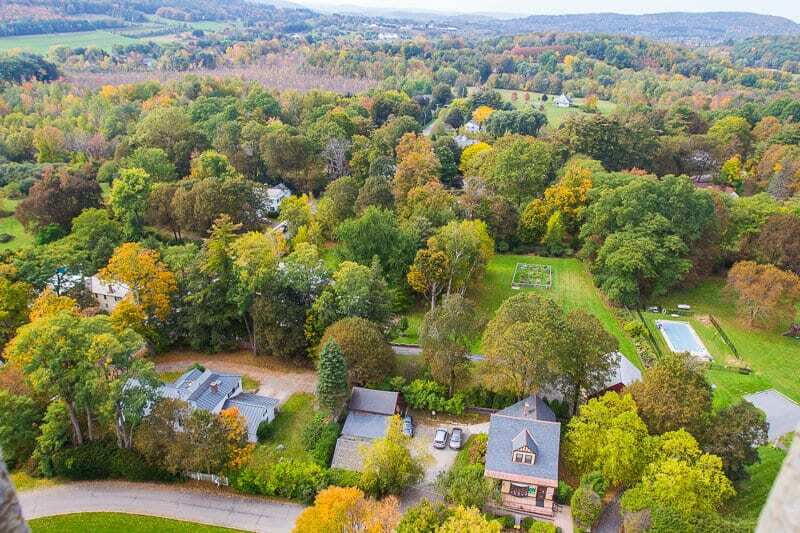 It offers a pretty birds eye view of the Bennington area, including where the battle was fought and all the way to New York state and Massachusetts. 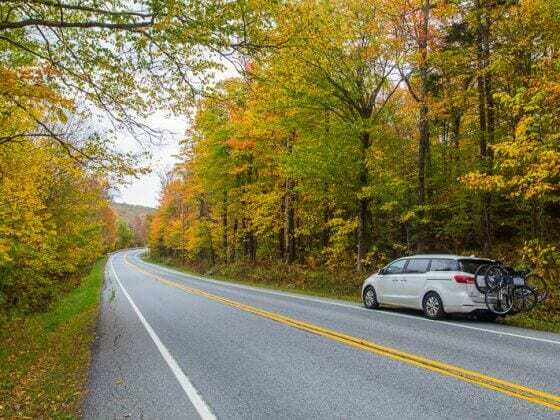 One of the most popular things to do in Manchester VT is the Skyline Drive! In true yTravel with kids fashion, we were late getting up the Skyline Drive which meant the lighting was harsh in the middle of the day for viewing and photographs: plenty of haze with the endless valley views. 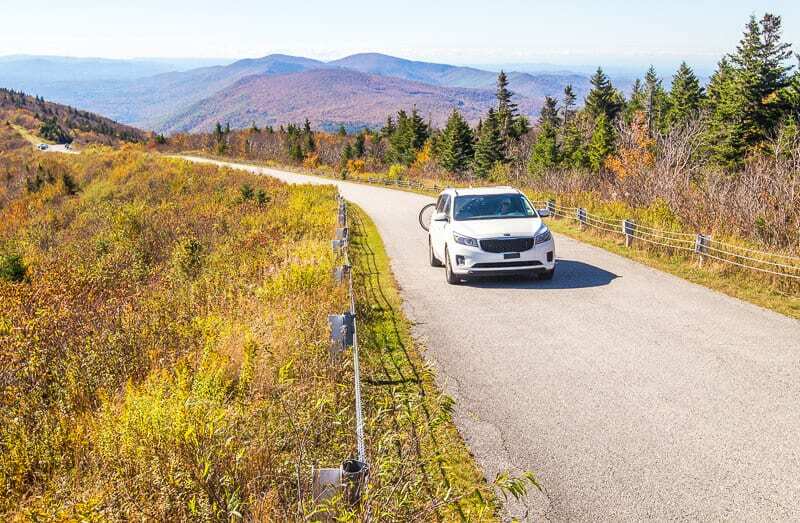 The Mount Equinox Skyline Drive is the longest privately owned paved toll road in the USA. 5.2 miles long, elevation increases to 3,235 feet. There are some parts of the Skyline Drive that were pretty, but not as spectacular as I was hoping as it was more brown in color. The auto toll road was a little expensive as well. We did three different toll roads in New England up mountains and this was my least favourite. I think if you went at the right time of the day and had more time to take some walks and have a picnic it would be a better experience. We did have a play with our new drone on the way back down though which gave us a wonderful perspective and some good video and photos. I’m pretty sure anyone can just pop into the Earth Sky Time Community Farm and it was one of the most interesting things to do in Manchester VT.
It’s a certified organic three generation family farmstead, wood fired bakery and thriving community of artists, musicians and friends and was founded by Oliver, the brother of Melissa from the Wilburton Inn. Melissa took us to see the cool things they are doing with the farm. Every week, the farm bakes 2,000 loaves of bread for local markets, restaurants and cafes. Earth Sky Time now has a community farm store with fresh produce from the garden. Oliver is also known for making amazing hummus. And they have various art and music programs and events on the farm. 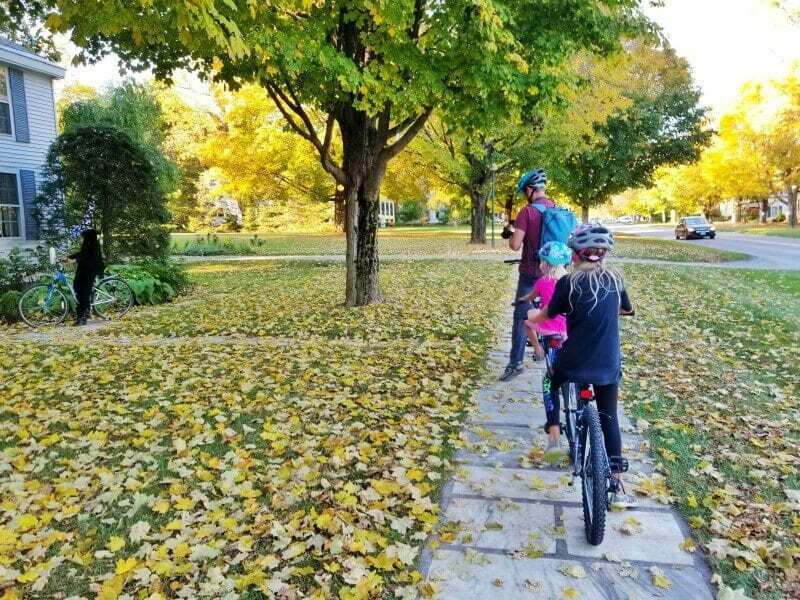 Oliver and his wife have recently started homeschooling their kids so it was great to have a chat with them about our roadschooling lifestyle and how to transition into it and make it work. 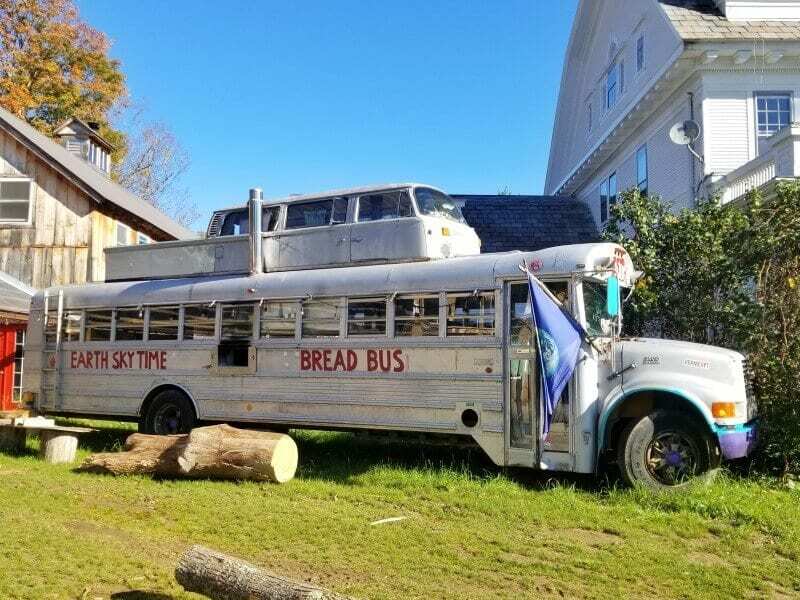 Would you road trip the USA in this bus? We also had a look at the bus Oliver welded together for his families road trip in the US. They baked breads along the way which they bartered for various things. How cool? The world is full of people doing fascinating things. The farm is also popular with WOOFers. So if you like to follow this volunteering strategy around the world this farm may be the place for you. Oliver has taken old shipping containers and refrigeration trucks and built woofing quarters out of them. Lots of sustainability things happening at this farm. If you like your accommodation to be more than just a bed to lie in, then The Wilburton Inn is for you. The property was built in 1902, but has been independently owned for 30 years by the Levis family. I enjoyed meeting with Melissa, the daughter of the owner, who has taken over as manager of the estate. Over breakfast, Melissa moved around to every breakfast table, greeting the customers, sometimes with a warm embrace, and spending time to find out a little of their backgrounds and lives. It’s really rare to see that kind of care and interest. There is a lot of love and passion behind creating a warm, friendly and heart warming experience at the Wilburton Inn. This is the kind of atmosphere that her mother created when the family took over the inn and transformed it from an exclusive resort to a warm and friendly place open to creatives and romantics. The Levis want their property to be more than just a hotel. Throughout the year, they put on fun events such as murder mystery weekends, Farm Nights with music and special menus, and holiday celebrations. 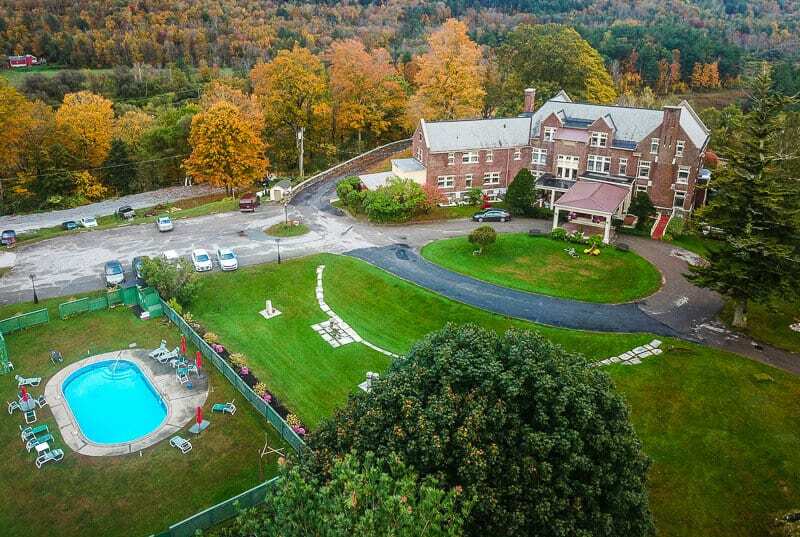 The Wilburton Inn also is the site for private yoga retreats, corporate getaways, with its beautiful vistas and historic charm, many weddings. Don’t miss the The Museum of the Creative Process, which consists mostly of a sculpture trail around the property. These sculptures pay homage to love and the art of Greece, Japan, Mexico, India, and Mesopotamia. There are seats near many of the sculptures for your reflection or meditation. The cottage was first built for the original innkeepers. It’s a two bed, two bath cottage that can sleep up to 6 people. The cottage has a kitchen and is spacious and cozy (especially with the wood fire burning at night.) 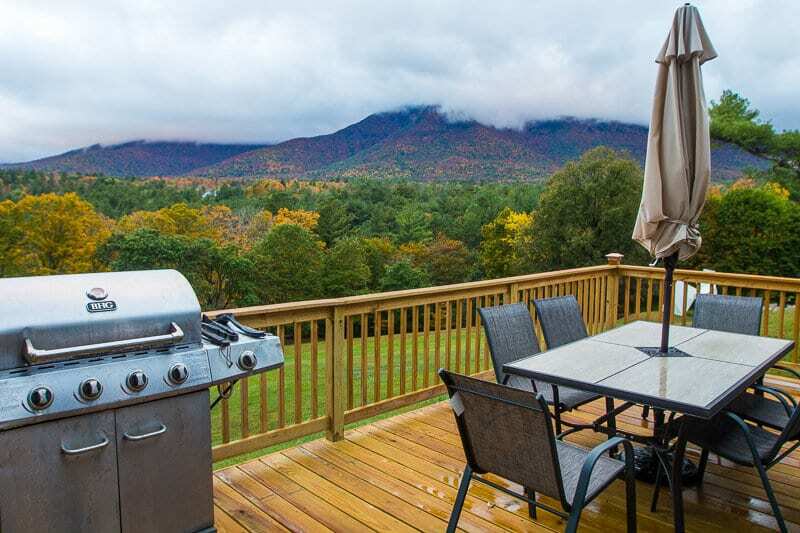 I loved watching the fog break over the mountain early in the morning during sunrise from the deck. We stayed for three nights as guests of the Wilburton Inn through the site Glamping Hub, which is an online booking site for unique nature-based accommodations with emphasis on a five-star experience. It’s the place to find accommodation experiences that become the memorable destination. On our first morning we headed to Up For Breakfast on recommendation by our waitress the evening before. It’s a local’s favorite tucked up a set of stairs in a cozy building. 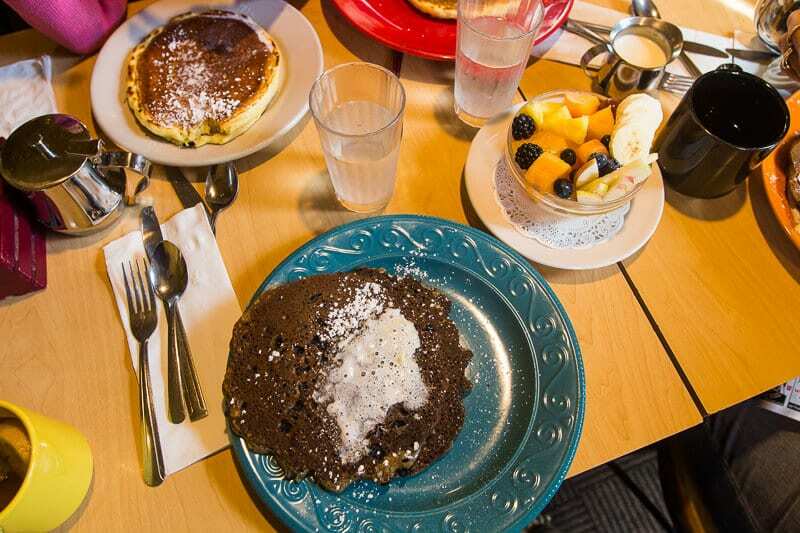 The carrot cake pancakes came highly recommended which I was dying to try, although they did not have a gluten free version, so we opted for the blueberry gluten free pancakes instead. You try the carrot cake ones for me and let me know what they are like, okay? The L-Shaped room is cramped yet grandmotherly cozy. It definitely wasn’t a fancy place and, while I didn’t think it was worth raving about, it was a local’s tip so we’re sharing it with you. We loved this little grocery store we discovered in the quaint one street town of Peru near Bromley Mountain, one of the ski resort areas in the Green Mountains of Vermont. Historically, J.J. Hapgood has been the longest continuously-running general store in the state. Owner Juliette Britton grew up in Peru and, with her husband Tim, revived the beloved general store in 2013. 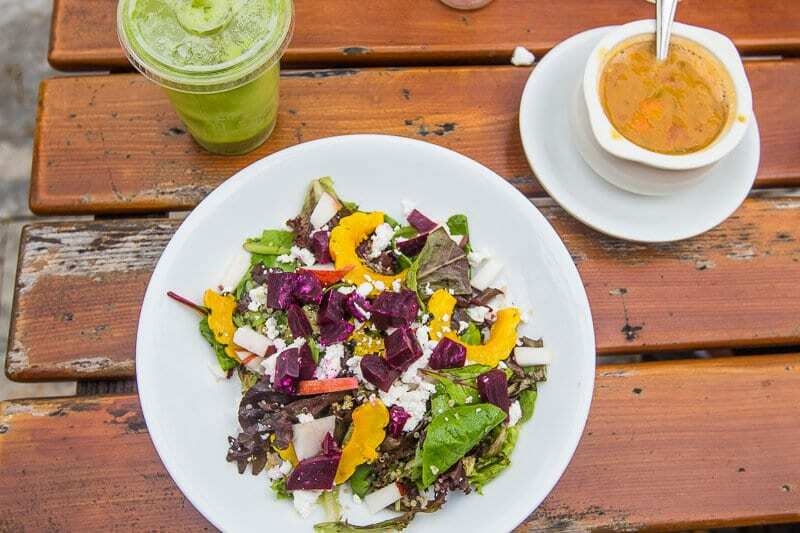 It’s now not just a store that provides provisions, and dry goods,and local produce, but it’s houses a local foods café, a custom wood-fired oven built by artisan Peter Moore, a gallery space, outdoor patio and growler filling stations. We ate delicious homemade food on the tables outside in the warm sun while the girls played games of corn hole and giant jenga in the garden. I highly recommend a a glass of the local kombucha on tap. It was a relaxing lunch after our Prospect Rock Walk. Another cute village near Manchester VT is Weston, home to Vermont’s oldest professional theater company. 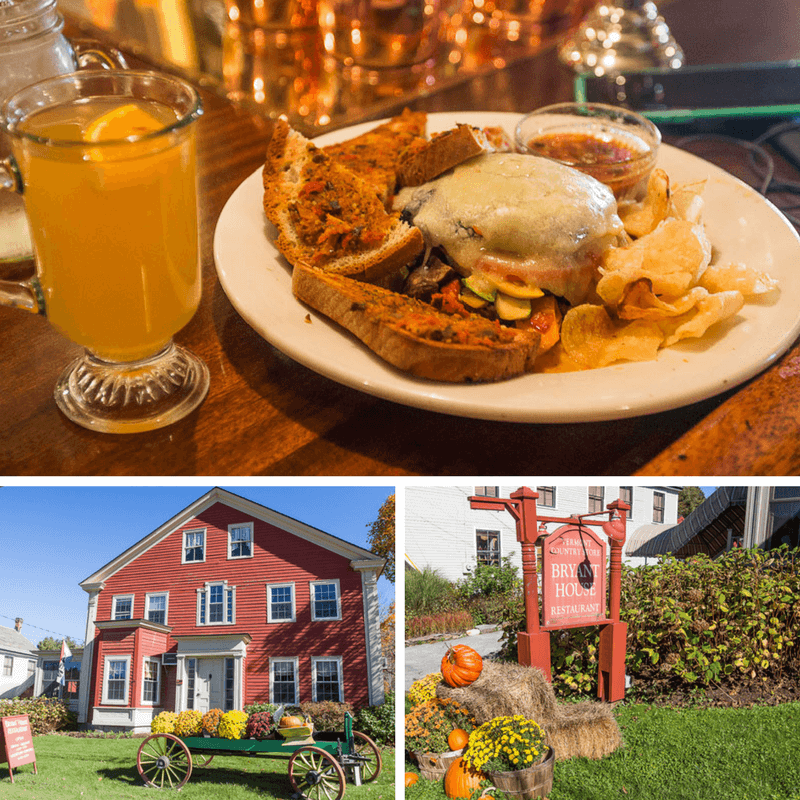 The famous Vermont Country Store is an impressive art gallery and the popular Bryant House, which is where we stopped to lunch on the way to Stowe. Next door to the busy Vermont Country store is the 1825 eating rooms at the Bryant House Restaurant. It’s popular so book ahead or arrive early. We sat at the bar in the 1885 bar room as we were in a hurry. The menu is pure New England fare, with classics like Yankee Pot Roast and Chicken Pie. The roast vegetable stack that I had was the most delicious meal I had in Vermont. 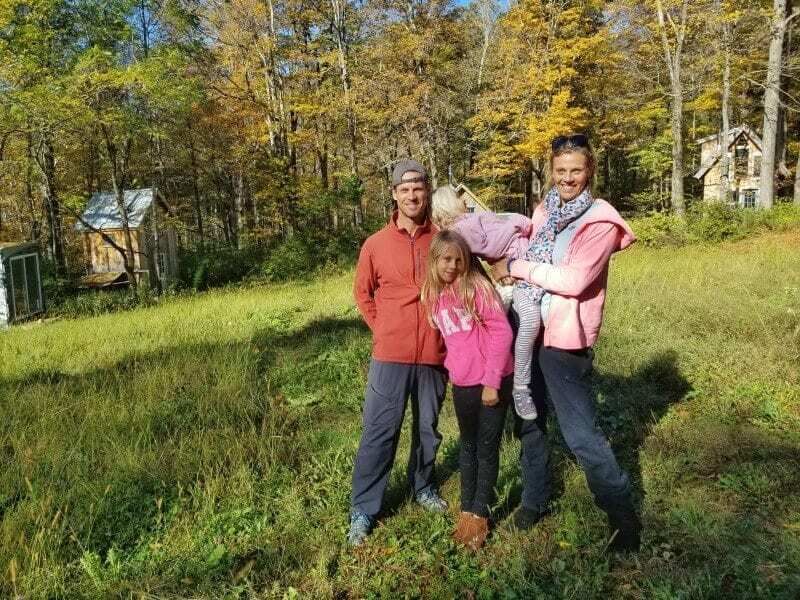 It was also Bryant House where we had our firs taste of hot apple cider – a Vermont speciality – it was delicious and is something we now seek out. 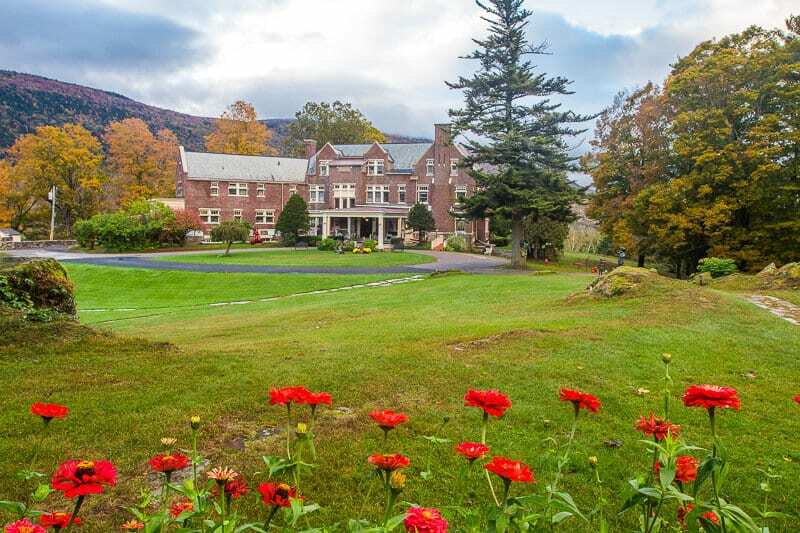 Booking.com has over 33 properties in Stowe. You get free cancellation on most rooms and a best price guarantee. Do you have any tips on things to do in Manchester VT? 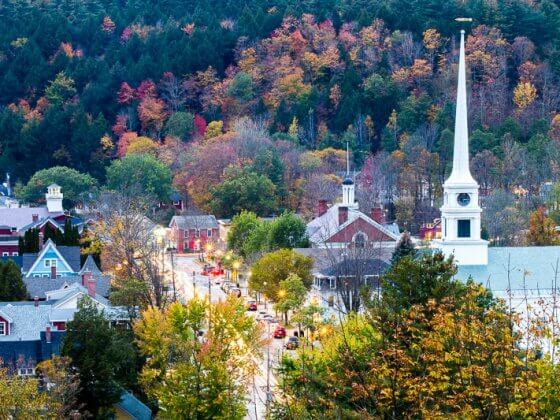 Or do you plan to visit New England in the fall? Share in the comments. Guys! Your blog is great. We’re Aussies currently living in NY and love looking for budget travel options to places nearby. 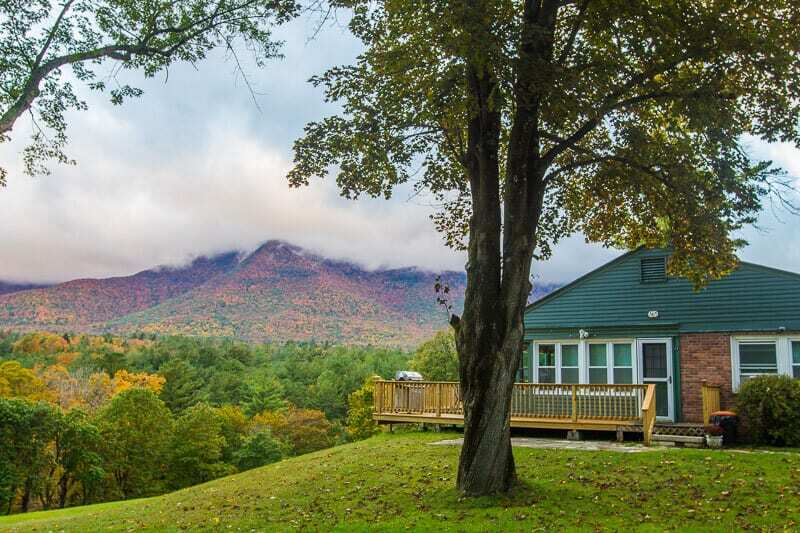 We haven’t yet explored Vermont but your post made us SUPER excited about it. Thanks for the travel inspo! Safe travels. No worries. Glad you enjoyed it! We have more to come.